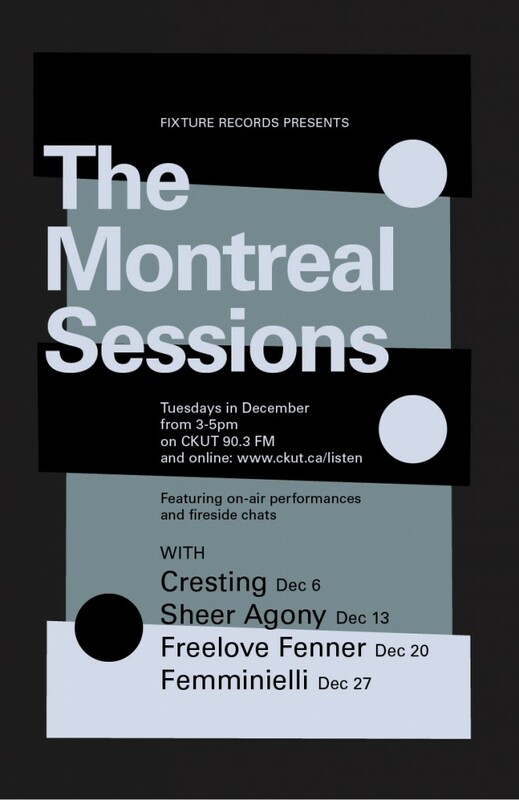 The Montreal Sessions: December 2011 edition! Our good buds over at Fixture Records, which is run by Conor Prendergast and Tessa Smith, are going to be the hosts of the December edition of The Montreal Sessions. Tune in every Tuesday in December between 3-5pm to listen to live performances and “fireside chats” with Fixture bands! Also, starting next week we’ll be featuring profiles on each of the bands to whet your sonic appetite for ’em, complete with photos of their jam spaces and a Q&A. Check the first profile this Monday! This entry was posted in Uncategorized and tagged cresting, femminielli, fixture records, Freelove Fenner, Montreal, music, sheer agony, The Montreal Sessions on December 2, 2011 by admin.